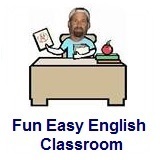 ﻿ Fun Easy English - new classroom free online classes english language lessons speaking listening writing reading december 2. 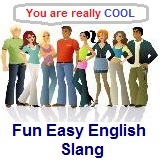 Today in the classroom you are going to learn some slang beginning with the letter W.
Today learn slang beginning with the letter W.
wad bundle of money You don't want to carry a wad like that with you in the big city. waste kill After you waste him, throw the body in the river. wheels car If you let me borrow your wheels, I'll go out and buy a pizza. white bread boring This class is definitely white bread. whiz talented person He is a whiz at the computer. whiz urinate I really have to whiz. wimp weak person You are such a wimp. winks sleep I think that you should get some winks. wired alert I am really wired after drinking five cups of coffee. wuss weak person Don't be such a wuss all the time. Say what you are thinking. An American football player would not be considered a wuss.